In the ‘industry’ as journalists and those of us aspiring to be journalists the summer months and particularly August are generally considered a rotten time when it comes to news stories. Parliament is in recess, everyone’s on their holidays and very little new is happening. So news organisations generally tend to fill newspapers, radio programmes, TV news bulletins and websites with just about anything they can eek out and dress up as ‘news’ when they’re running a few columns or a few minutes short. In some cases they’ll send their presenter on a pointless exercise in a Spitfire. In others they’ll report the most trivial things as breaking news. Look, for example, at Sky News’ ever bright yellow ticking breaking news bar which yesterday reported: “AP news agency: The US recall of eggs amid a massive salmonella outbreak is expanded to half a billion eggs”. Obviously, a salmonella outbreak isn’t good times, but egg-scuse me if I’m not really too bothered about how many eggs have been recalled, I certainly don’t need it interrupting my news bulletin. In some cases, news outlets will just rehash old news like the proposed demolition of Ringo Starr’s old house on Madryn Street, Liverpool. This has been due for demolition for years now under the controversial Pathfinder initiative. But no harm in reminding us and finding someone whose outraged about it to fill some space. I also find the coverage of the dreadful floods in Pakistan interesting. For example (and only because this is the news bulletin I catch most evenings) Channel 4 news have been reporting on an almost nightly basis on what’s been happening in the region and fair play to them for doing so. No doubt it is helping the appeal for aid, but the cynic in me wonders if we’d be hearing as much from the region were it another time of the year. We all forgot about Haiti pretty quickly didn’t we? Of course this could all just be the major cynic in me but I have been part of putting together a programme at the BBC this week and that has been a struggle given the dearth of news and the dearth of people around to talk about any stories that are happening. Unlike those who wish this relatively warm, if not sunny, weather would remain, journalists are wishing time away so as that parliament can return, politicians can say and do stupid things and elsewhere there’s news aplenty. 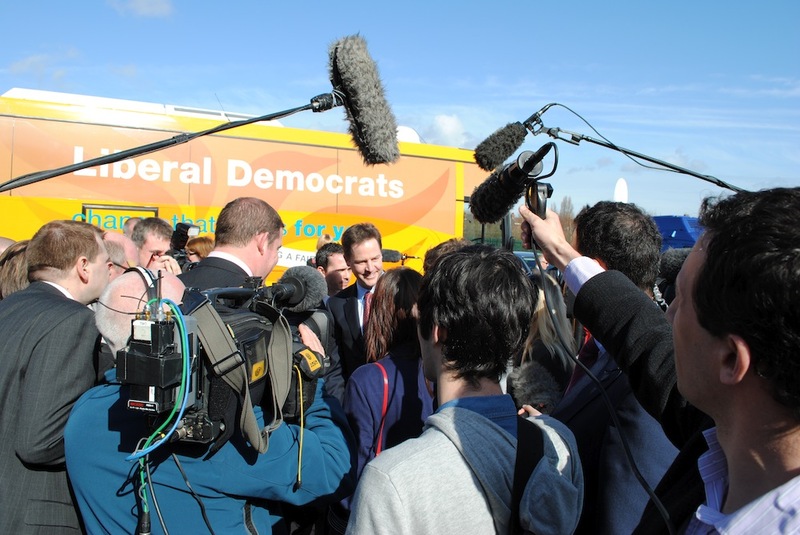 So the choice was clear, a day doing dissertation in the library or a sunny afternoon in Penny Lane stalking Nick Clegg as he met locals, and did countless interviews, including taking a brief question from yours truly. There was a certain thrill and excitement in the air as the nations media descended on the Penny Lane Development Trust Centre for the visit of the Liberal Democrat leader. He’d spent the morning and early afternoon branding Gordon Brown and David Cameron as “corrupt” amongst many other things before descending on Liverpool Wavertree, where he’s hoping his party’s candidate Colin Eldridge can win the seat from Labour. Clegg was smooth as you like, he knew how to work the community centre people and then work the media as he was dragged left, right and centre for various interviews. Sky News even made him wait three minutes while they finished interviewing Yvette Cooper. The cheek! And when it was all over, he jumped back on his bus, adorned with his face and that of the party’s much lauded Treasury spokesman Vince Cable, and departed Wavertree. It was sunny, it was brief but my word, it was all very exciting for this political journalism novice! As I come to the end of my final year at Liverpool John Moores University it’s hard not to be sad particularly when I know that myself and the people who I have worked closely with over the past few months (you all know who you are) in developing our fantastic website will all be going their seperate ways come May/June time. We will meet again for graduation (I hope!) in July and then that will be it. Some already have jobs lined up in the industry, some are going on different career paths, and some, like me, just aren’t quite sure yet. In the short term I have a placement lined up at BBC Manchester for a month in May and I keep threatening to fill out the daunting application for BBC North but until I do that and start applying for journalism jobs elsewhere I am left contemplating how amazing these past three years of my life have been as well as cracking on with my dissertation. I am also now doing some blogging on the general election for Sky News’ website. I posted my first entry today about the exciting election battle in Liverpool Wavertree. Do please check it out and feel free to comment. I’ll probably spend more time procrastinating on job applications and dissertation by replying and attempting to engage in a lengthy debate!